Even if you can’t make an appointment, here are some good general guidelines from Dr. Csoka: It is important to avoid foods that cause inflammation in the body and depress the immune system. Avoid saturated fats, refined foods, sugars, and juice. Include an antioxidant supplement with a multi-vitamin. B-complex (50-100 mg a day), plus extra B12 for pain. Try rubbing St. John’s Wort oil on the lesions for pain relief. Information on Shingles: Shingles is caused by the varicella-zoster virus, the same virus that causes chickenpox. After an attack of chickenpox, the virus lies dormant in the nerve tissue. As we get older, it is possible for the virus to reappear in the form of shingles. Shingles is estimated to affect 2 in every 10 persons in their lifetime. This year, more than 500,000 people will develop shingles. Fortunately, there is currently research being done to find a vaccine to prevent the disease. Although it is most common in people over age 50, anyone who has had chickenpox is at risk for developing shingles. Shingles is also more common in people with weakened immune systems from HIV infection, chemotherapy or radiation treatment, transplant operations and stress. 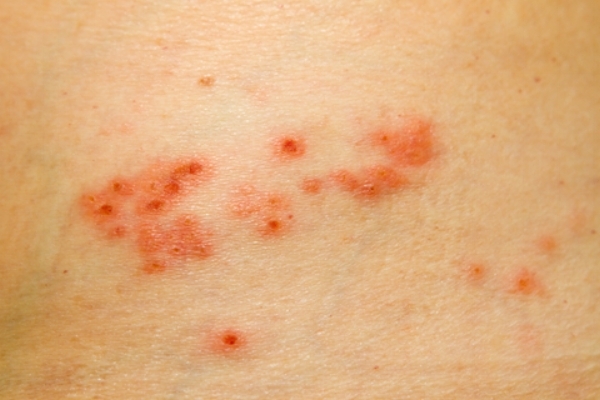 Are other complications associated with shingles? Yes. If shingles appears on the face, it can lead to complications in hearing and vision. For instance, if shingles affects the eye, the cornea can become infected and lead to temporary or permanent blindness. Another complication of the virus is postherpetic neuralgia (PHN), a condition where the pain from shingles persists for months, sometimes years, after the shingles rash has healed.